Launch Conductor Dr. Calvin D. Fowler posed for this publicity photograph on May 2, 1962, leading up tothe launch of the Aurora 7 Mercury-Atlas 7 orbital mission, manned by Commander Scott Carpenter (1925-2013). This image is part of a series of publicity stills by General Dynamics/Astronautics division, the company responsible for Project Mercury vehicles and their launches, that were typically distributed to the media for their use. 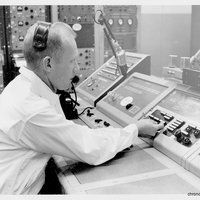 Dr. Fowler is in his Launch Conductor's position in the blockhouse, where the button to ignite the Atlas rocket was located. “Dr. 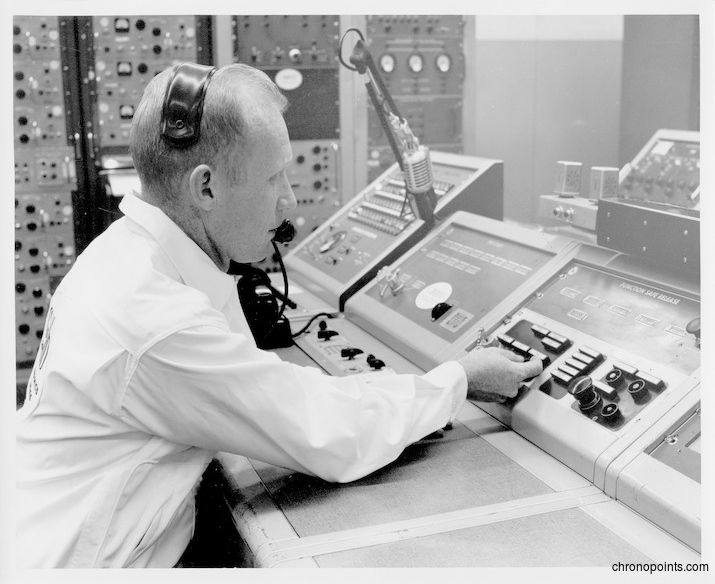 Calvin D. Fowler Using Launch Console at the Cape Canaveral Air Force Station Launch Complex 14 Blockhouse.” RICHES of Central Florida accessed April 19, 2019, https://richesmi.cah.ucf.edu/omeka/items/show/4984.